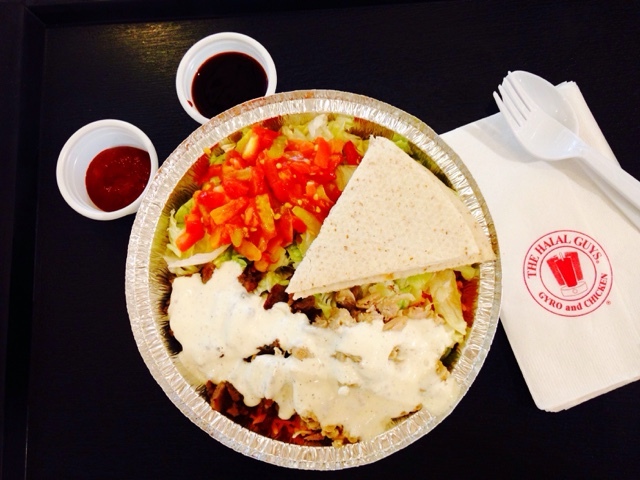 Ever since I heard they were opening The Halal Guys here in Manila, I was already excited to try it. Now luckily, since I went on a weekday mid afternoon, there was no line. I ordered the chicken and gyro special for 275 pesos. Looking at the picture, it looks appetizing, fresh and flavorful. Sadly, this small platter did nothing but disappoint me. There were no onions, the sauce was not flavorful and they charged you extra for more. I could not really taste the meat and chicken. The rice, was not even of good quality compared to even the rice you get at your local canteen, except this was yellow. I would not even consider calling this middle eastern as it lacks the qualities that I would associate with that cuisine. I can’t even fathom, the pita was not even thin and warm. Better to eat at uncle moe’s or food channel for my gyro fix. If I had more cash I’d go for Cyma. This was a bland excuse for food. Definitely not going back here. Everything is overwhelmingly tasty to a fault. Need a place to go after a night out? Bold flavors on the go at Yalla Yalla.